Henley Royal Regatta 1992, traffic flow document with a map showing tents, and car access. Yellow sheet of paper with black text and a red Henley Royal Regatta logo centre top on the front. On the reverse is a black printed map with traffic routes marked with red arrows. Henley Royal Regatta, compliments slip. 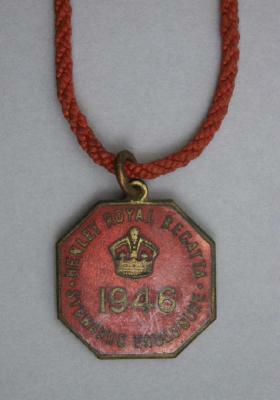 White slip of paper with black text and a red Henley Royal Regatta logo centre top on the front. Gives contact details and lists the patron. Henley Royal Regatta, information slip regarding the allocation of badges. White A5 piece of paper with red printed text on one side. Merrymaker train price list and timetable to Henley on Thames for 5th to 8th July 1979 during the Henley Royal Regatta. 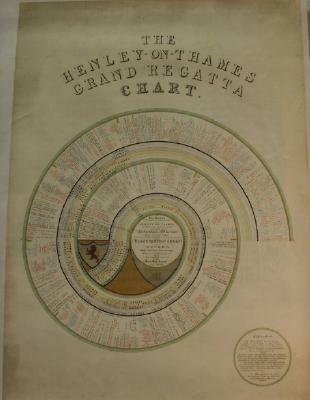 Colour photocopy of 'The Henley on Thames Grand Regatta Chart' showing in a spiral form the winners of the Regatta prizes, 'general memoranda for each year', Regatta rules and boat builders of the winning boats from 1839 to 1849.
Henley Royal Regatta badge, 1946. Octagonal enamelled metal badge. 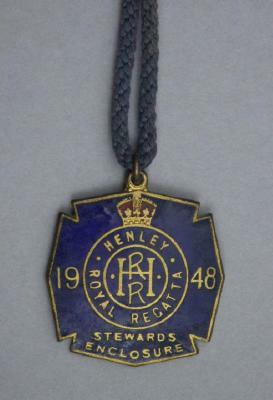 Henley Royal Regatta badge, 1948. Square enamelled metal badge. 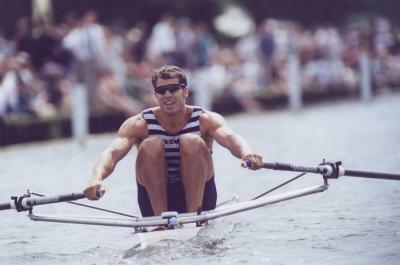 A colour photograph of Jamie Koven, Diamond Sculler at the Henley Royal Regatta in 1998. 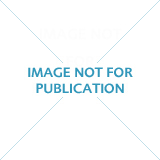 A colour photograph showing a rower (Koven) racing in a single scull. He wears sunglasses, a navy all-in-one with white stripes on the top half ("RBC" is on the front of the all-in-one). Knickerbocker oars. 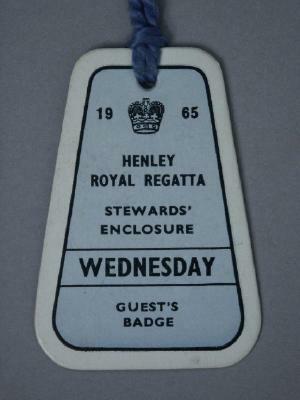 A Henley Royal Regatta Stewards Enclosure badge from 1965.